Eric Burdon had been the lead singer of British R&B enthusiasts The Animals, and in the late 60s, following the breakup of the original group, had relocated to California and put together a new group (credited as Eric Burdon & The Animals, or The New Animals) which went in a more psychedelic direction. However by the end of the decade this group had also broken up, and Burdon was weighing up his options, one of them being returning to England and retiring from the music scene. He didn't retire though, as in L.A. he met a Danish harmonica player called Lee Oskar. They got on well, and started performing together whilst looking for musicians to put a new group together with. They came to the attention of producer Jerry Goldstein, who helped them in their search by directing them towards a black R&B group known as The Nightshift. They were an eclectic group of musicians, with a great deal of jazz and latin influences which made them stand out from the average R&B band. They joined with Burdon and Oskar, and adopted the unusual and memorable name War. The full lineup consisted of Burdon (lead vocals), Oskar (harmonica), Lonnie Jordon (keyboards), Howard Scott (guitar), B.B. Dickerson (bass), Charles Miller (sax & flute), Harold Brown (drums) and Papa Dee Allen (percussion). An eight-piece, multi-racial, multi-cultural group, with a shared background in rock, pop, blues, R&B, jazz and latin music, they were destined to be something different from the start. They began their career playing clubs in Southern California, and went on to tour for almost a year before releasing their debut album on MGM Records. 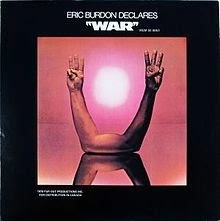 Eric Burdon Declares 'War' was a very interesting, explorative mix of rock, blues, funk, jazz and latin sounds, most of the album taken up two lengthy (over ten minute) jams (one based around John D. Loudermilk's "Tobacco Road", the other a slow blues loosely based on Memphis Slim's "Mother Earth"). In many ways it was similar to what Burdon was doing with his last few Animals albums, but with a tighter, funkier backing. Another unusual aspect of the group was their use of the harmonica and saxophone together to fill the role of a horn section. Burdon's vocals were as powerful and bluesy as ever, and his new band was fantastic, but it was by no means an instant recipe for commercial success. Somehow they managed to do it though, as the latin-tinged single "Spill The Wine" became a #3 US pop hit, effectively launching the band's career. Many,MANY thanks for posting this album in it's original form! It's a long time favorite of mine and though the RAINBOW ROAD collection is fine,it inexplicably omits one track and changes the order of the others. A deluxe reissue is in order! Nice place! Brings back days gone by… A blog which offers psychedelic Burdon, lovely Donovan, underrated Earth Opera or Shawn Phillips, magic John Martyn or Peter Green cannot go wrong. Millions of thanks for sweet memories of youthful crushes still well alive.